I needed a redesign and I started last year working on the logo for DesignRabbit. I created a logo that I really fell in love with but then I got busy with Yahoo! Buzz and some other projects. I wanted it to reflect my Cindy Li blog but have a different palette to it. So I came up with this color scheme. I started with the main page layout so it could be more of a slide show and it was framed. I decided that the frames were too heavy but I loved the navigation. So I kept those and started over again. Plus the behavior wasn’t something that I was fond of. It was a bit too cumbersome. Everything so far was going fine except the “portfolio detail page” was a bit off. I decided to take out the listings of other projects because if the project list got longer then it would be scrolling further than I wanted. The site is created using WordPress.My friend Marianne Masculino was their “Happiness Engineer” and we were discussing how everyone thinks WordPress is only a blogging platform but I’ve created a few sites like Eggar’s School, that use the WordPress CMS to do more than just that. I used Chalet Comprime in my logo but when Matt and I started researching the usage (as he was putting it into SIFR) we read the requirements for usage. Last week I blogged about “font licensing and embedding” that it was $1700. I wasn’t kidding. So I opted for using dafonts.com’s font Lady Ice instead. It wasn’t my first choice but my budget can’t handle $1700 to use a font. I started putting up the designs into Flickr all on 500x500 white backgrounds.Why 500x500? The medium size for Flickr is 500x500.I decided to fit within Flickr’s image standard to make my life a bit easier. I tagged each of them portfolio and it also allows me to be found via another way on the web. The images are entered into the CMS and Matt wrote a caching system to accommodate for when there are Flickr hiccups plus improving the performance. 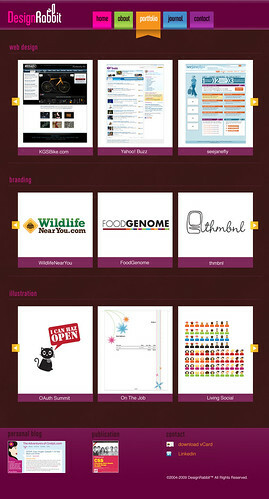 I’ve been using flickr to keep a repository of my work as I create it so it was easy to reuse them. I roped in my boyfriend, Matt Harris into coding the website. 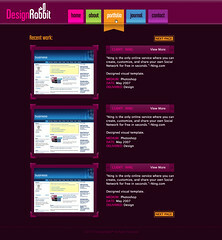 For the geeks that want to know the details behind the site.It was written in HTML5, it uses JQuery for the animation and it is supported from IE6 and up. It is IE8 ready. It is using Cufon although we know it has accessibility issues.It uses Sprites for the navigation and the images are stored on Flickr but cached locally (in case Flickr has any hiccups) and it makes it accessible for those instances where you are prohibited from seeing Flickr (i.e. schools). The back-end uses customized WordPress plugins to handle all the custom fields required by the portfolio. 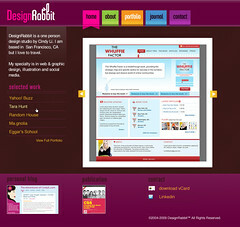 The new live site : DesignRabbit. 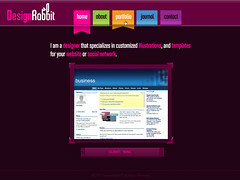 Really nice write up :) I really love the new Design Rabbit site. The colors are very well chosen, composition is perfect and it’s easy navigate through the portfolio. The whole site and its look is really ‘you’. It’s colorful and yet very professional. Congrats on a superb job! Awesome site. I enjoyed reading about your design process. You might want to check the first page on the portfolio. I think I saw a couple of broken image icons. Could just be a Safari 4 bug though. I’ve noticed it do that on a few sites. Ohh, nice! I was afraid you’d redesigned THIS site, which I have great affection for. LOL! I never want it to go away. Then saw the new official Cindy Li site, which is so rich and displays such great work. Nicely organized, too. Love it! Thanks for the very interesting write-up on your decisions and choices. 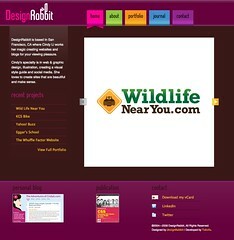 DesignRabbit looks great, I really like that logo, very nicely done! 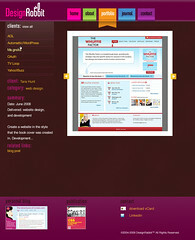 The whole site is very well designed with a great choice of colors that work well together. + A Great portfolio that’s well presented. I find It is very hard designing for yourself, I’ve been trying to do it for the last couple of weeks and i just keep scrapping it or changing direction, You have nailed it nicely ...so great job! I really enjoyed your write up because there is so much more that goes on behind the curtain and rarely to people take notice. There was a lot of thought process and integration for smooth sustainability and being the latest and greatest that represents you. Very well done.